Hope that a $700,000 settlement with Mister Carmelo - one infamous Carmelo Garcia would permanently stall at upper levels of HUD came to naught according to well-placed sources on the controversial payoff to settle his civil claim against the Hoboken Housing Authority, City of Hoboken, former Mayor Dawn Zimmer and her husband Stan Grossbard. Members of the HHA board in addition to the mayor and her husband were also sued individually by Garcia before the payout was finalized. 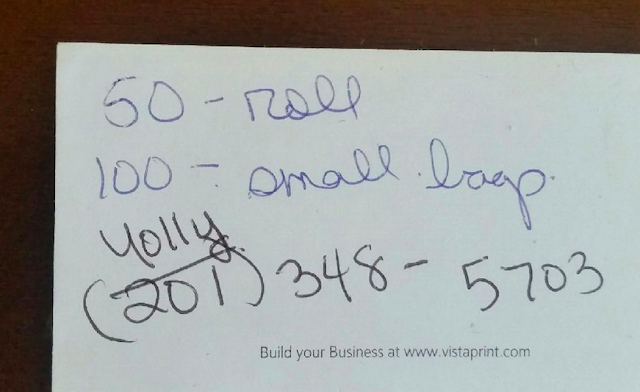 email showing evidence of bid-rigging involving an aide to State Senator Brian Stack? What was seen as an attempt to use the 2013 mayoral election as a wedge failed to see Dawn Zimmer capitulate to Garcia's demands that a controversial redevelopment project to more than double the size of the downtown HHA be approved. Many observers saw the effort, called Vision 20/20, or Vision Money Money as a self-enrichment plan for connected Hoboken and HudCo politicos and a sure-fire way to increase a vulnerable population known for selling their votes for $40 a pop come election time. The Carmelo Garcia litigation nets him and his attorney Louie Zayas a fat $700,000. MSV originally broke the story last November stating a deal had been cut in the seven-figure range. Questions about the deal surfaced after the Hoboken mayoral election saw Ravi Bhalla eek out a victory with 32% of the vote propelled by the backlash of a controversial "terror flyer." The $700,000 payout will come out of the HHA's coffers. The agency housing Hoboken's most vulnerable population paid the entire bill for the sordid affair and it's not covered mostly by insurance. "Carmelo didn't care where the money came from," said one source. "He just wanted the money. Hurting the people at the HHA meant nothing to him." Speculation is rampant why the failed lawsuit suddenly landed up, in the end, costing the agency so much when a counter suit filed against Garcia later was so strong. There's more to the story. As one lawyer said, "The entire system is broken and worse incestuous" pointing to public institution agencies and insurance carriers rolling over for one another in civil claims that survive initial dismissal actions. The always controversial Carmelo Garcia saw his initial civil claim in 2013 completely thrown out of court on the first attempt, mostly on the second yet somehow he refiled it and netted a bounty of cash with a third refiling. Confidential informants allege there's a bounty of bad behavior by Garcia while he was Executive Director at the HHA. In addition to the seven-figure contracts illicitly given to vendors without approval and contributions to Garcia's political committee for NJ Assembly, there are more illicit allegations. 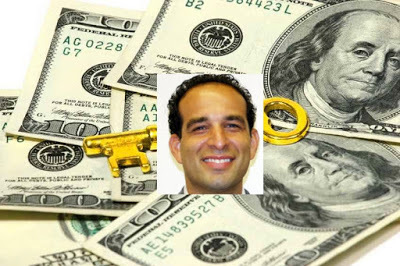 "There's evidence of bid-rigging during Garcia's time at the HHA," another source offered. The email dated June 6, 2014, came from a Hoboken Housing Authority employee to then Executive Director Carmelo Garcia. The name of an HHA employee has been redacted on the advice of MSV legal counsel as the authenticity of the email cannot be verified with the parties. The alleged email references two people, a Carlos and "Yoli (Brian Stack assistant per Carlos)." The alleged email goes on to reference agency bidding and an underhanded scheme where "once the bids for the garbage bags come in you will tell him the lowest price so he can go lower." Bid-rigging in public agencies is illegal. According to the alleged email, the HHA employee concludes to Carmelo Garcia a heads up on the bid-rigging closing with, "I just want to let you know because the reception area was crowed and you know how rumors start." One confidential informant stated the alleged email and bid-rigging in this particular effort was not successful for reasons unstated but added, "Others were." An alleged note tied to allegations of attempted bid-rigging at the Hoboken Housing Authority involving a "Yolly,"
Talking Ed Note: MSV did not contact Carmelo Garcia for this story. In the past, Garcia threatened to file a criminal complaint with the Hoboken Police Department for receiving a question by text on public policy while he served as ED at the HHA. Garcia is currently believed on two public payrolls. MSV reported on the two taxpayer paid jobs: one in Newark and another as, wait for it.... an Executive Director of the Irvington Housing Authority. It didn't last. Update: Or did it? 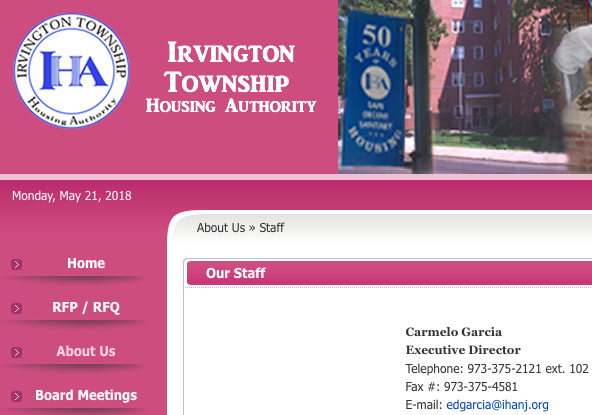 The Irvington HHA website shows him actively employed there with Mister Carmelo hosting an active voicemail. You can hear Mister Carmelo invite you to leave him a message at the number. By way of a fyi, there's new leadership at the US Attorney's Office in Newark.